If you haven’t talked to a farmer lately, you might not realize that farming is far from an individual activity. Farmers rely on each other to learn best practices for growing more with less, so they can reduce food waste and protect the environment. 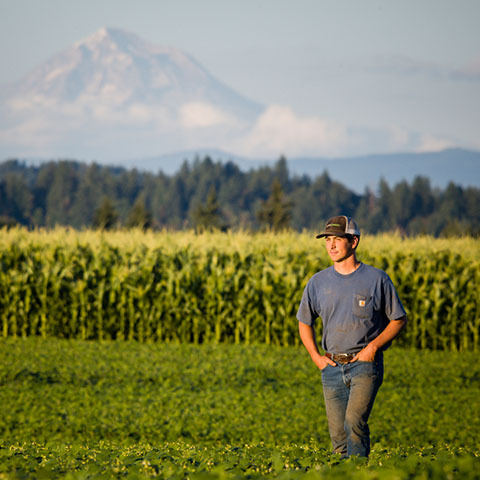 Ryan grows corn, green beans, cauliflower, celery and squash on his farm in the Willamette Valley. One of the things he’s learned from his colleagues? How to prepare his fields to get the most out of his plants come harvest. Ryan Koch works together with other farmers to make sure they’re doing what’s right for the land. Koch also uses reduced tillage techniques for optimal crop results. He uses a mechanical harvester that enables him to harvest as many vegetables as possible efficiently, so they can be frozen or canned at peak freshness. This means less good product left in the field and more on your dinner plate. Part of making the whole system work is making sure harvested food gets put to good use. John Boelts, a farmer who grows leafy greens in Yuma County, Arizona, has made it his life’s work to collaborate with other growers to ensure excess produce gets to those who need it. Much of the country’s leafy greens are grown in Yuma County on farms like John’s and packaged and sold by big food companies, like Dole or Fresh Express. Because of their perishable nature, fresh veggies need to be shipped to a processor within 36 hours of harvesting. But sometimes, that doesn’t happen. John’s work with food banks and Ryan’s smart farming practices serve as a reminder of the great things that happen when farmers talk to each other. Want to learn more about reducing food waste on the farm? Read this story about how one farmer uses extra watermelons.